The revolutionary new Magik Frame™ holds signs in place on nearly any surface and, at the same time, functions as a sheet protector. Magik Frame™ can be repositioned and reused many times and it will leave no residue or cause any damage to the surface to which it is applied. 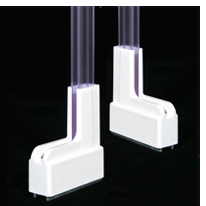 Magik Frame™ is also usable on both hot and cold surfaces. For details, click here. The self-piercing flag sign holders snap onto the top of standard store shelving, or into the front 1.25" channels of standard store shelving. When attached to the shelves, these products support small signs by piercing sign stock with with a hinged piercing mechanism. Once pierced, signs can be rotated for desired position. For details, click here. 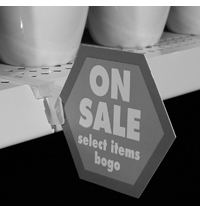 Use the magnetic sign boots, in combination with the matching heavy-walled poster channels, to mount signs to metal surfaces. Signs can be held in either a horizontal or vertical format. Sign change-out is fast and easy and the sign boots and poster channels can be reused many times over. For details, click here. Popco's new series 7 x-mas tree clips compliment our other varieties of x-mas tree clips with a variation on head size and binding capacity. The series 7 clips feature a head size of .94" and a binding capacity from .050" to .44". The series 7 fits 3/16” diameter holes. For details, click here. 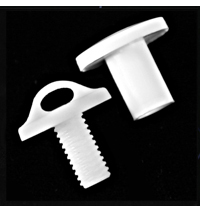 Popco now offers 2-inch, extra-long viking-hat and flat-cap fasteners. 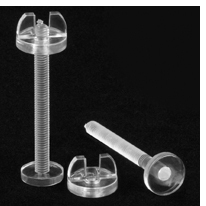 These fasteners are quick-assembly binding screws that push together to close and unscrew to remove. 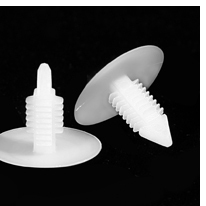 Now available in four lengths, the viking-hat and flat-cap screws will fasten together materials ranging from approximately .35” to1.33”. For details, click here. Push-lock loop-screws feature an open loop on the screw head. The open loop allows for the attachment of beaded chain for use with swatch books. The loop-screws also create hanging points and work with wire hooks and other hanging hardware for foam board signage. The posts and screws grip and hold simply by being pushed together; threading is not required. For details, click here.